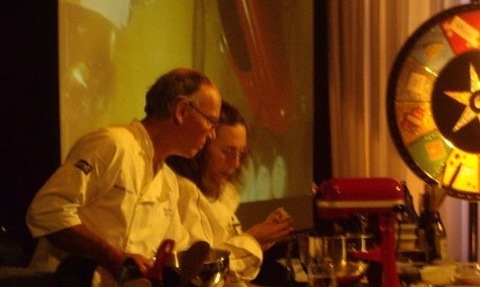 Woody and I had a great fun adventure as participants in Tom Douglas's Culinary Camp in Seattle this past July. We arrived a day ahead to avoid jet lag which gave us the added benefit of visiting this beautiful city. 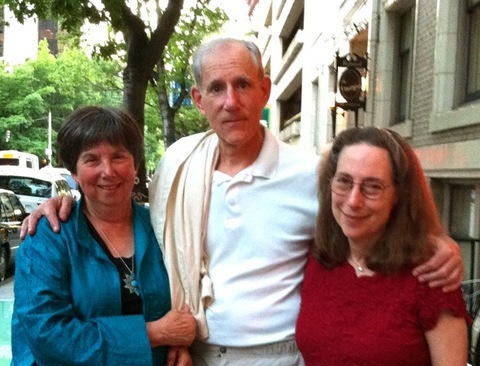 The first night was a very special reunion with friends Arnie and Judy Bendich whom I hadn't seen for about 45 years! (Arnie and I had been classmates at the University of Vermont.) It was, of course, thanks to the internet that we found each other again. The next morning, first stop was the famed Pike Place Market where we sampled a wide array of seasonal thornberries, including humongous blackberries, purple and black boysenberries (a cross between raspberries and blackberries), and incredibly flavorful strawberries. 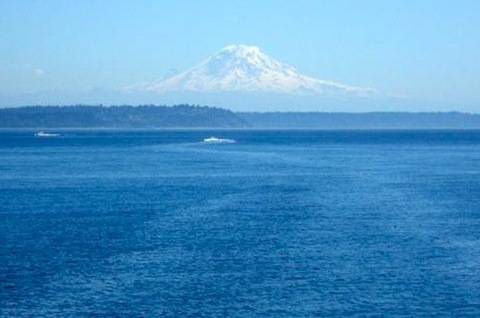 We took the Bainbridge Ferry to Bainbridge Island for lunch which afforded us a spectacular view of Mt. Ranier which seemed to be levitating in air. 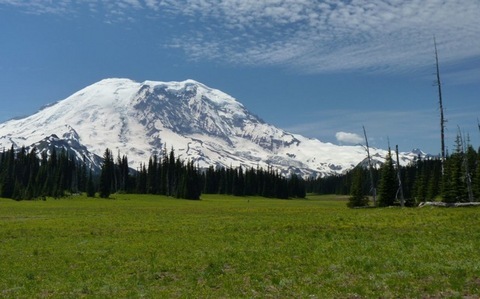 Arnie, knowing how much I love that mountain sent me this closeup he took while hiking. 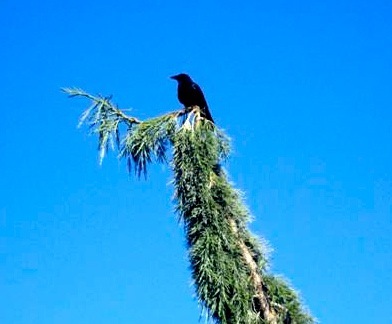 After lunch we took a walk along the Seattle shoreline where we spotted this crow attractively poised atop a pine tree. 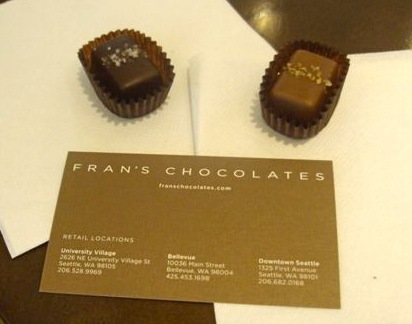 We stopped at the reknowned Fran's Chocolate boutique to have my favorite dark and milk chocolate covered caramels adorned with fleur de sel. 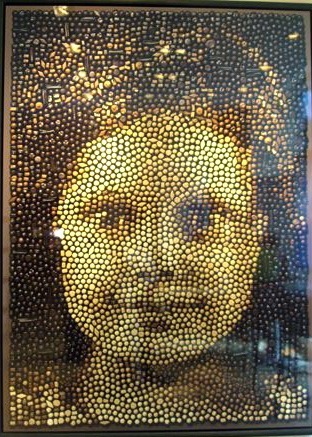 We were amazed by what we thought was a photograph of a child's face and discovered that is was Fran's granddaughter the 'pixels' of which were made up of little chocolates. After our walk, we made a visit to the Dahlia Lounge kitchen where the cakes for tasting and for the next day's demo were in full swing, to offer suggestions and advice. 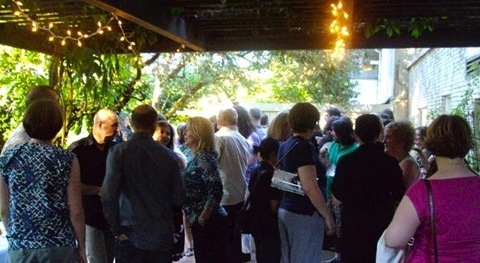 We then boarded the bus to join the Culinary Camp group for an extraordinary dinner at Café Juanita. We enjoyed cocktails and tantalizing appetizers on the patio which included foie gras wth preserved ginger, tender baby octopus, and thin slices of pristine lardo (raw pork fat). This cocktail hour gave us a chance to get to know many of the members of the group and to catch up with Tom and his charming wife and partner Jackie. 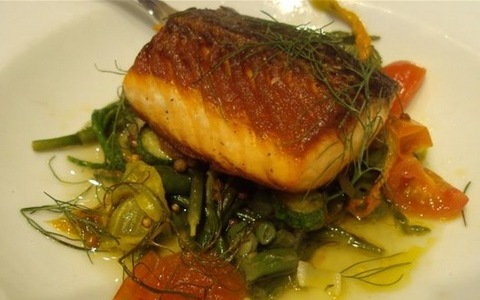 Chef-owner Holly Smith is a protégée of Tom Douglas's. Dinner began with an inspired first course: tajarin with American white sturgeon caviar and crème fraîche, followed by house smoked sablefish with pappa al pomodoro and toasted horseradish vinaigrette. We were in heaven. Next came tiny, hand-made gnocchi made with goat cheese, egg, and flour (without the usual potato) accompanied by heirloom cherry tomatoes, guanciale and marjoram, and the most deliciouos steak I have ever experienced. When I asked Chef Smith what made it so and variety of the steak, simply seasoned with salt and pepper, and brushed with butter. 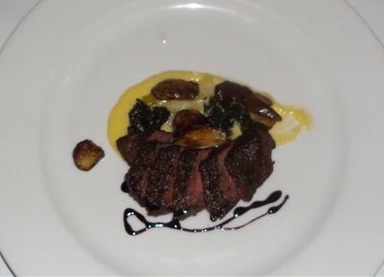 It was a perfect illustration of how a great chef knows when not to guild the lilly! The Arugula salad with local strawberries and pinenuts was dressed with 25 year old balsamico The dessert stood up perfectly to the excellence of the rest of the dinner. It was a small rectangle of mascarpone cheesecake, baked up-side-down so that the crust stayed crisp when unmolded. The mold had a design that formed little shallow depressions in the top of the filling--perfect for adding colorful pools of flavorful sauce. 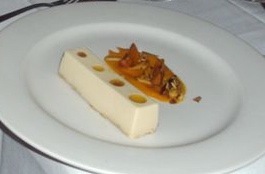 Garnishing the plate was an apricot crema, almonds and thyme. The next morning our event began at 10:00. We demo'd three cakes from Rose's Heavenly Cakes: the Golden Lemon Almond, the Red Velvet, and the Deep Chocolate Passion Layer Cake. Tom's pastry chefs did an extraordinary job with the prep and with samples for everyone to taste. Tom, was a lively MC, interjecting fun commentary. The "Campers" were a delightfully knowledgeable group asking interesting questions. 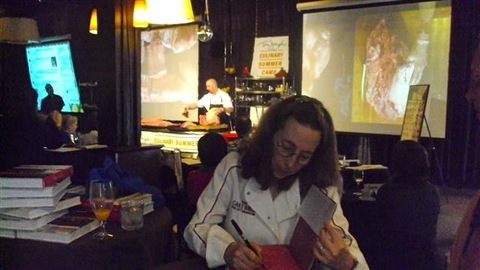 Immediately following the demo, we moved to the adjoining room to sign copies of the new book and several of my prior books while the next demo, on butchery, was taking place. 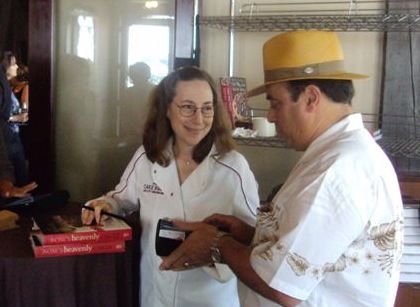 Towards the end of signing who should appear but chef Thierry Rautureau. I had 'met' him when doing Tom and Thierry's radio show over the phone and was delighted to meet him in person. 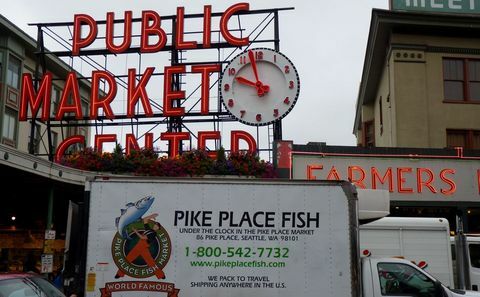 I had mentioned to Tom, the night before, that I was hoping to have Woody taste the wonderful wild Pacific salmon as this was his first trip to Seattle. Tom, host par excellence, despite all the events going on, managed to arrange for us to have a salmon dinner at one of his restaurants, The Palace Kitchen, which was not open for lunch. Woody was delighted as this was the first time he had the experience of having a chef cook just for him. 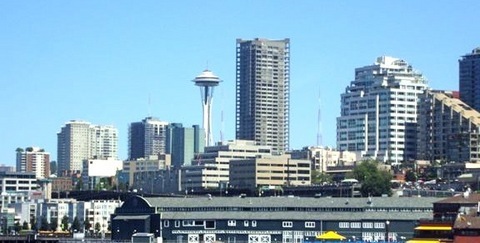 We invited the Seattle Beranbaum family to join us for thecampers' farewell barbecue and they, in turn, invited us to visit the Seattle Space Needle which provides the best view of the entire city, the surrounding countryside, the Pacific Ocean, and the both the Cascade and Oympic moutain ranges. The next morning, before leaving, I encouraged Woody to be sure to look out the right side of the plane window on his return for the other-worldly view of Mt. Ranier that rises above the clouds almost to the level of the plane. We had the most wonderful experience and Robyn, who did a stunning job of organizing the events, told us that next years' camp is already booked to capacity! We hope to be invited back sometime in the near future!